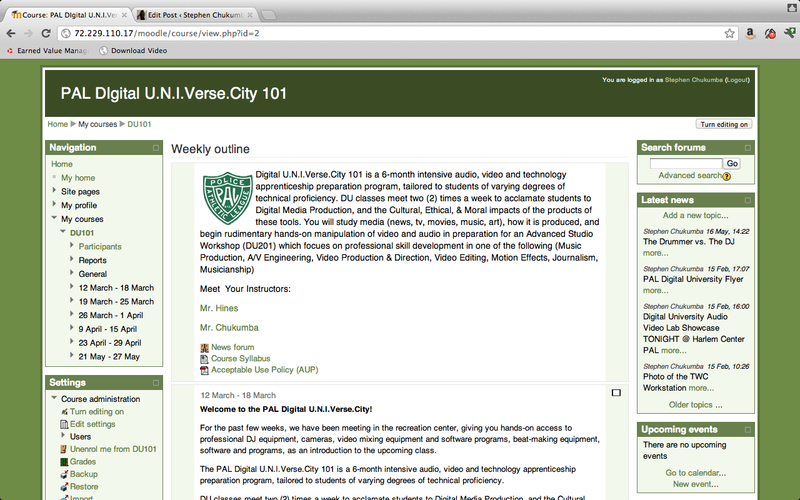 A snapshot of the Moodle we developed to teach out digital curriculum. When you think of the digital divide, the first thing that comes to mind is the standard issue of the gap in access and exposure to technology, between children of different economic circumstances. This lack of access and exposure, leaves lower income and minority youth at a marked disadvantage, by depriving them of skills which are becoming increasingly valuable in the workplace and essential in various industries. But there is a deeper issue. Unlike us, children today are exposed to technology and digital content, regardless of economic background, to a far greater extent than any other period in history. Internet capable mobile devices, social media, interactive gaming systems, and a torrent of digital content, are the norm, not the exception. Youth today immerse themselves in completely virtual worlds, and engage in social interactions and activity, across a variety of devices and platforms. iPhones, Blackberries, Androids, PS2s, Nintendo DS3s ( and the list goes on) enable youth to play games, surf the Internet, update their status, listen to music, watch videos, text, chat and share content with each other wirelessly. We need to examine how this exposure is impacting our youth, and what implications the “mobilizing” of technology has on them. I believe we should be creating curriculum, which addresses the responsible use and utilization of technology, and programming that harnesses the inherent familiarity with handheld technology that youth have, regardless of economic circumstances. Ever since I began teaching at the PAL Digital U.N.I.Verse.City, I have been able to see what youth of today are doing with technology. Most youth know how to surf the net. Any kid knows how to get to YouTube, or send an email. They know how to use Google, Bing, Ask.com and Yahoo to conduct searches, and find pretty much anything they’re looking for. Their mobile phones are extensions of their hands, and their fingers were built for texting (I’ve even seen a few texting without even looking at the phone). As such, their behavior, adoption and use of technology is distinctly different from ours, and requires a distinctly different approach for educating them on using technology responsibly and appropriately. Most classroom instruction on technology teach kids the basics. But kids today need real lessons which go beyond the basics. They need instruction that helps them see technology as an extension of their inherent creative capabilities. In our course, we’ve married the theoretical with the practical. First off, our course lives online. We developed a Moodle, which each student can access, where each lesson, document, evaluation, reference, and assessment can be accessed. When we teach about Canon EOS 60Ds cameras, the kids are shooting on those cameras. If we talk about data transfer and tagging, the kids are transferring content from the cameras and putting descriptive tags and meta content within the files. Our classroom instruction recognizes that these kids need a level of engagement that challenges them, and expands their horizons. More importantly, academic institutions need to accept that technology is changing at an ever increasing pace, and we have to be prepared to meet the youth where they are (which is far more technologically savvy then we were at their age).